3D visual Project reporting system is based on geography environment and present the space information through visual effect. geographic information visualization is one of the most important technology of information visualization. It puts all the elements into a real 3D world and realize data visualization and WYSIWYG. visualization technology is a method to record the phenomenon, discover the rule and predict the result. It can be applied to human-computer interaction, geographic information, project management, environmental simulation, medical diagnosis, agroforestry management and so on. The effect of 360 panoramic virtual tour of road construction is more visual than 2D images. It gives an overall investigation and evaluation for the quality, visual effect and coordination with surroundings of the construction. The visual record of urban road, vessel, bridge, high way and their affiliated transport facilities construction is used to examine the transport planning project make comparison and assessment for the carrying out through the record in different periods. 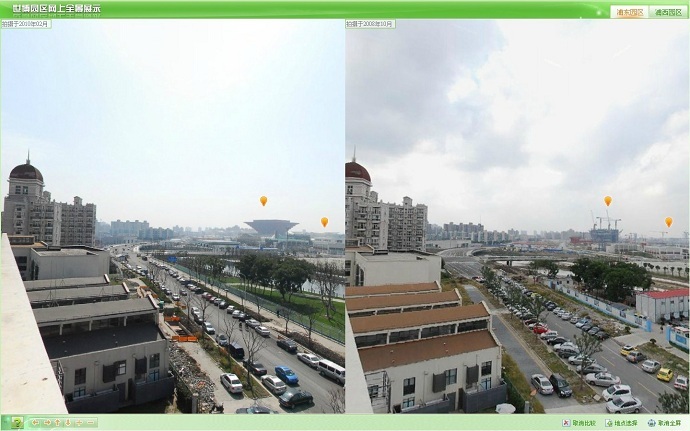 Connect panorama with transportation management system, such as urban public transport GPS management system, safety management system. It can be used to supervise key site in road administration management and becomes business process system as a part of transport system. Combining panorama with map in live navigation system, it helps drivers to use navigation system more conveniently and visually. In the aspect of accident investigation, 360 panorama can be used to record the site and helps investigator to invoke the panorama anytime. The visualization record of different phases of construction of estuary, reservoir, dam can be used to set up system acceptance archive. With GIS, decision support system can be used for record of construction of water resources and hydropower, underground powerhouse, concrete dam, construction layout and other environment condition. It can be used for planning and management of water resources, water environment, water and soil conservation, irrigation and water conservancy for the convenience of the monitoring center to watch at real time. Compare with textual data, panoramic visualization record can be used as the evidence of other project analysis and research. It can be used for 3D visualization record and archiving of construction of foot bridge, building facilities; Project closeout visual record; achievement exhibition in website of engineering company; 3D visualization system with overall solution for intelligent architectural effect presentation. Business area covers urban construction virtual tour, tourism landscape virtual tour, training with the emulation technique.